Sun- fantasy film,Clouds- cotton balls,Barn-popsicle sticks,Barn roof- tin roofing,Silo- aluminum foil,Sky- silk dance skirt,Land is a mixture of Vera Bradley quilted purse, plaid, wool blanket, and a plaid corderouy fabric. This modular and its time constraints gave me some trouble, but I ended up liking the shallow composition. I used a mosaic treatment on the gingham checked wallpaper to make the composition more interesting, and took a more organic treatment on the teapot, which makes the composition contrast a bit more. I had a great deal of trouble on the deep composition, although I did like the sunflower picture I added for a punch and to balance out the composition. I do not really care for the finished product, and would change a few things if I could. I would try to find a deeper way to set up the image to make it more visually interesting and have more spatial depth. I haven’t had any time to work on this modular yet, and this is just a rough sketch, so any suggestions would be appreciated. Naturally, I will have a reference photo to work with once I approve it with the owner of the property. There will be a silo beside the barn, and I do not have textures figured out yet for the barn and the barn roof, and also the silo… I was thinking tin foil for it…maybe crinkle it up for the top part. Thanks! After many complications arising, this project was overall a very tough modular for me. It did not turn out how I wanted it to, and I am not satisfied with the results. I should be using my re-do on this modular, unless I completely miss another one. I feel like in the end, it took on a somewhat cartoon-ish quality. I also wish there was a better way to make a wood grain texture that looks realistic. I liked how the layering of the wood came out against the tablecloth, but I think it would have turned out better with a realistic wood grain. Although I am not overly satisfied with this project, I did learn a few more techniques, and plan on learning quite a few more to help me with the next few modulars. 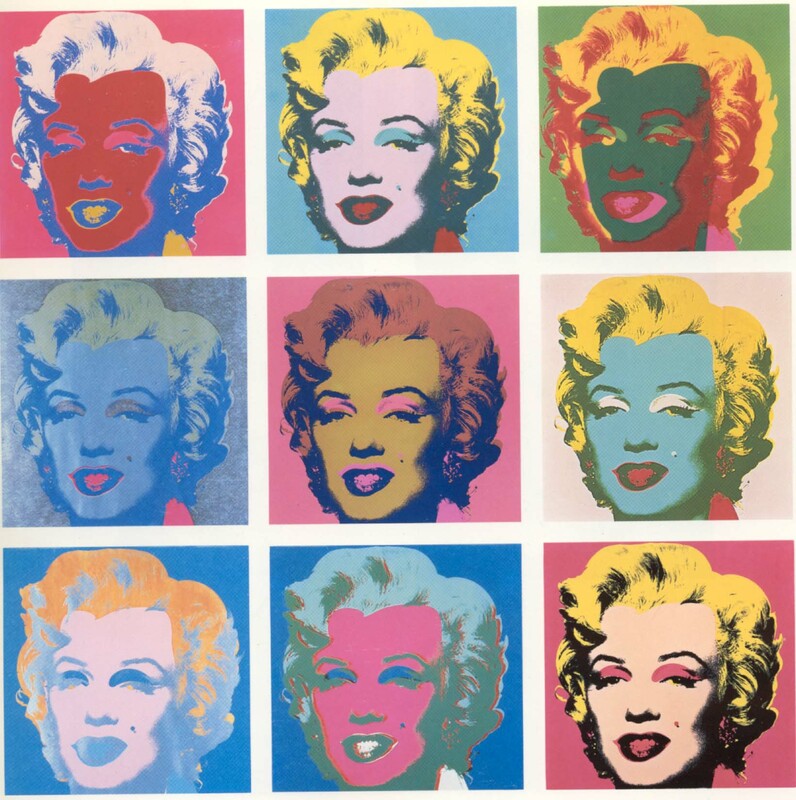 I chose to look at Andy Warhol’s “Marilyn” for this assignment. The passive space in this composition includes the lines in between the different faces, and also the solid colored space behind her face. This provides a “visual rest” for the composition. Because of the over-load of color, the solid blocks behind her help your eyes to rest. The color changes and overlapped style of this composition present active space. The solid backgrounds also provide for an established figure/ground relationship in the composition. This modular was a bit more difficult, especially trying to figure out what aspects I wanted to use for the ambiguous design. Once I decided to just use the pegs of the gears for the ambiguous composition, I was able to make a successful ambiguous design with no definite figure/ground. I had trouble with the organic design also, but in different ways. I felt that my rough drafts were very hectic looking. Nothing really worked together at first, and after playing with it for a while, I found that the many different styles of organic gears were complicating the design way too much. I decided to use only one version of the organic gears, but with varying values and scale. I am pretty happy overall with my geometric composition. I enjoy the layering effect I ended up with. I think it gives it more of a clock-like design. I want to play more with value next time though. Other than that, I really like my designs.